iClever kids headphones boasts superior sound quality with 85 dB volume control, which is great for all kinds of kid’s music and movies. The small earcups and drivers deliver an enjoyable listening experience. iClever headphones for kids are the clear winner when it comes to a kids-friendly design. Your kids will fall in love with the cat-inspired design and impressive purple color at their first sight. It not only can make their girlish dream come true but also become a nice toy for their extended use. Super lightweight is specially designed to fit for little heads. It won’t become your carrying burden. During the period of listening time, your kids will enjoy the intimacy with memory-protein earcups along with high-quality sound. There is a modest adjustable range for iClever kids headband. Constructed with a twisted headband, iClever kids headphones are ready for an active kid’s environment. The toughness of headband is beyond your imagination. The 3.5mm Audio cable uses a flat-style construction that is tangle resistant. The shining features of this material are that it won’t knot in a mess and it is sturdy enough to withstand certain extent of pulling, dragging and rubbing. The earcup and headband padding is made of food grade material that is resistant to stains and is easy to clean. There may be some slight pressure points around the outer ear if the earcup padding presses against the ear for a few hours. In order to provide your kids with more comfortable sound experience, we recommend take it off after long sessions of listening. THE SAFEST OPTION - You would be wise to steer clear of these while your child is young for the number of kids with damaged hearing is increasing. Luckily, iClever kids headphones are generously recommended to protect vulnerable and sensitive ears with 85dB volume limiting (Recommended for kids age of 3-12). Not only it cares for their little eardrums but also it is beneficial for hearing over the long term. 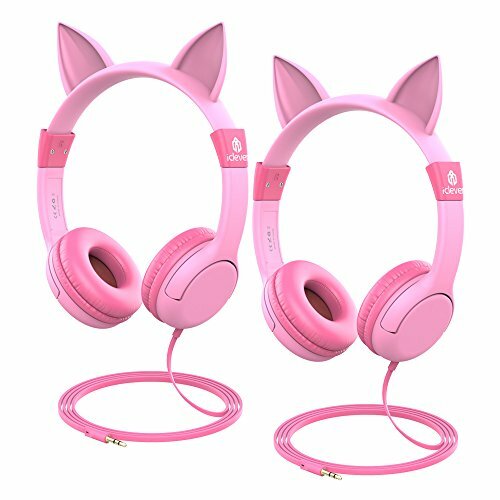 PLAYFUL CAT-INSPIRED DESIGN - Combining high quality audio with unique fashion, iClever children headphones are finished with two cat ears on the top of the band. No matter your kids are a cat person or not, they are cute beyond doubt. And the impressive shape will catch the fancy of them, especially for those who is obsessed about the cat. Cat-related headphones will fulfill every girlish dream and fancy. START FROM HEALTH - iClever headphone for kids adopts high quality food grade materials. Namely, it is made of nontoxic materials and designed to withstand the environment of intended use. Therefore, we always maintain the desired nature and credible production of quality. All of these can be traced to be the health of kids. Having certificated by a number of authorities like RoHs, EN71, CPSIA, FCC, it won't cause any negative effect to your kids even with long time wearing and touching. ADJUSTABLE HEADBAND WITH UNIMAGINABLE TOUGHNESS - Getting headphones that will survive the hard treatment of little kids is an important factor to consider. iClever kids headphones always keep this in mind. Won't worry it will become small pieces of nothing even with destructive treatment. The headband design is easy to adjust, with the earcups sliding up or down at the base of durable headband. It is flexible to accommodate a wide range of head sizes. There is very little clamping pressure. UNIVERSAL COMPATIBILITY & SATISFYING SERVICE - With the standard 3.5mm headphone jack, works with virtually all smartphones, tablets, such as Apple iPhone, iPad Mini, Samsung Galaxy Phones, Lenovo, Android Cellphones,Tablets and more. You are entitled to enjoy 18-month replacement warranty and 24-hour Customer-friendly Support Service. Any questions please feel hassle-free to contact us.